I confess. I believed that I could do it all. 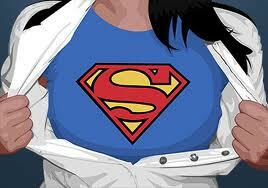 I believed that I could be a superwoman. That is until I crashed and burned last night. I had the most excruciating headache and I couldn’t do anything. I couldn’t cook, clean, bathe K, nothing. My husband did it all while I took a bath and tried to seek God as to where I’m going wrong. The Holy Spirit quickly let me know that I’m doing too much and without the power of His spirit. The Holy Spirit let me know that I wasn’t being a Proverbs 31 woman, but a superwoman. A superwoman is a woman who thinks she has to do it all—be gourmet cook, have an immaculate home, excel at work, be a supermom, and an effortlessly amazing wife. I laugh now as I read this. Who could do all of this without crashing and burning? This happens because Christian women easily make the mistake of confusing the Proverbs 31 woman with a superwoman. When we read Proverbs 31, we see that this woman is busy. She rises early. She makes her family breakfast. She works outside of the home. She exercises. She’s thrifty. She seemingly does it all. However, I believe the difference between the Proverbs 31 woman and a superwoman is the Proverbs 31 woman relies on God to tell her when, where and how to execute these duties and she relies on His strength to accomplish them. In John 15:5, Jesus says “…apart from me you can do nothing.” Where I went wrong and where many of us go wrong is that we go full speed ahead without seeking God for His perfect timing and guidance. I forgot that the Lord wants us to seek Him for every aspect of our lives—no matter how mundane they seem. The Holy Spirit told me that I was being like Martha (Luke 10:41). I was worried about many things, but I neglected the most important thing—sitting at the feet of Jesus. I want to be a Godly wife and mother, but the Lord reminded me that my goal is not to be a superwoman, but a Godly woman. If I seek Him first, He will direct me in all the other affairs of my life. Having a clean house is nice, but if it’s at the expense of my relationship with Christ, then I can do without it.